Opinion: How Safe is a Public Space When Some of Us Feel Nervous Around Open-Carry Weapons? | Back Page | Style Weekly - Richmond, VA local news, arts, and events. Opinion: How Safe is a Public Space When Some of Us Feel Nervous Around Open-Carry Weapons? Scott Elmquist Virginia’s open-carry law was fully on display at the Unite the Right rally in Charlottesville on Aug. 12. 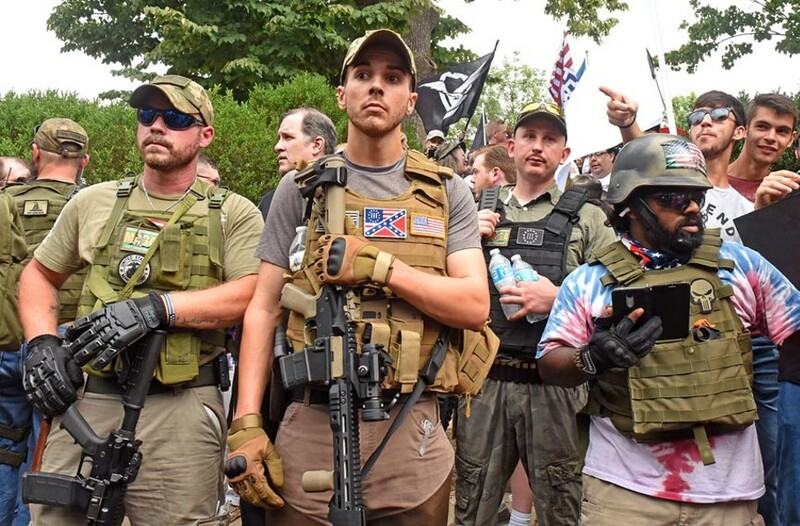 One of the most troubling aspects of August's white supremacist march in Charlottesville was the presence of armed militia carrying military-style semiautomatic rifles. Other rally goers carried pistols on their hips — and likely carried guns concealed elsewhere. Outgunned police officers charged with keeping order failed to interpose themselves between the heavily armed white nationalists and the counterprotesters confronting them. In Charlottesville, one person died and dozens were injured. But we were fortunate the event didn't end in a mass shooting. A firecracker or an automobile's backfiring could have been enough to set off a fusillade that might have left dozens dead or wounded. Especially after the recent horror in Las Vegas, it seems more important than ever to prevent future occurrences of this kind of armed rally. Why allow people to carry deadly weapons at a politically-charged demonstration? For that matter, how wise is it to allow people to walk around town openly carrying weapons under any circumstances? Consider the terribly difficult position this puts our merchants and law enforcement officers in. Consider the added danger we the public face as armed people — especially those with limited training — walk among us. Recently, as I was about to shop at my local supermarket, I noticed someone walking in ahead of me wearing a pistol. How was I to know his intention? Was he armed to protect himself and his fellow shoppers from criminals, or was he planning to rob the store himself? I turned around and went elsewhere. But this recklessness gets worse. Police working to maintain order at the recent demonstrations on Richmond's Monument Avenue wisely decided not to allow attendees to arm themselves with helmets, clubs, sticks, shields or other devices. But the police could not, by state law, forbid demonstrators from carrying firearms. This guarantee of what is known as open carry put both law enforcement officers and the people they are sworn to protect in jeopardy. The birthday of Martin Luther King Jr. has become a day to demonstrate on both sides of the gun issue. Annually, hundreds of Virginians supporting sensible restrictions on gun ownership and others endorsing broader Second Amendment rights assemble in Capitol Square to lobby their legislators. Capitol police don't allow the demonstrators to carry signs on sticks, lest they be used as weapons. Meanwhile, Second Amendment supporters walk freely around the grounds carrying handguns and rifles. It would be hard not to laugh at the absurdity — if it weren't so dangerous. Even city councils and boards of supervisors are prohibited by the legislature from excluding armed people from their meetings. No matter how angry you are at your local council members, you can walk into their meetings with a gun. This looks like another invitation to potential disaster. Through the years, we've heard multiple reports of disgruntled residents or public employees taking out their anger on local lawmakers with gunfire. Does it make sense to prohibit council members from trying to protect themselves by at the very least making their meetings weapons-free? As Dalia Lithwick and Mark Joseph Stern wrote, in reporting the Charlottesville confrontation in Slate, Gov. Terry McAuliffe's initial response suggested that "... the presence of large quantities of lethal guns had in fact effectively silenced the many people who'd assembled to peacefully express their opposition to racism." Do Americans really want our Second Amendment to prevent us from freely exercising our First Amendment rights to assemble in public places and express our views, without having to face armed intimidation? Maybe after Charlottesville and Las Vegas, it's time for the General Assembly to step back from its liberal open-carry laws that allow us to tote weapons virtually anywhere we choose. Our legislators should amend current law to restrict the circumstances when firearms may be carried in public. At the very least, weapons don't belong at public demonstrations, at government meetings or in public school and university classrooms. We also can use our collective economic clout to place limits on open carry. Currently, the law permits private individuals and businesses to restrict people from bringing weapons onto their property. Several of my doctors' offices already feature signs on the doors designating them as weapons-free zones. I'm a gun owner myself. But I don't want to shop in a mall, a supermarket or convenience store while other patrons are walking around armed. If one of the stores I visit allows other customers to carry firearms, I find someplace else to shop. But I also register my objection with the management. I want to make sure it knows why I'm spending my money elsewhere. If enough of us take that position, arming oneself in public could become, at the very least, less convenient. And finally, local government leaders should have the right to protect their own safety, and the safety of their constituents. City councils and supervisors should debate and pass ordinances that prohibit residents from carrying weapons in public buildings, or at the very least in council chambers. Would such legislation violate current state law? Does the state really require city council members to allow people into their meetings armed with lethal weapons? Let's find out. Pass the ordinance, and then let the Commonwealth or Second Amendment advocates take the city or county government to court. Paul Fleisher serves on the staff of the Richmond Peace Education Center.